"I do not know if I'll play on Friday"
Rafa Nadal is already in Spain . About 6:20 in the morning landed the number two in the world in the T-4 of Barajas after winning the U.S. Open, the last Grand Slam of theseason, against Novak Djokovic. The Manacor be incorporated in training Wednesday with the Davis Cup team in this weekend host the permanence eliminator at the Caja Magica in Madrid (from Friday to Sunday). 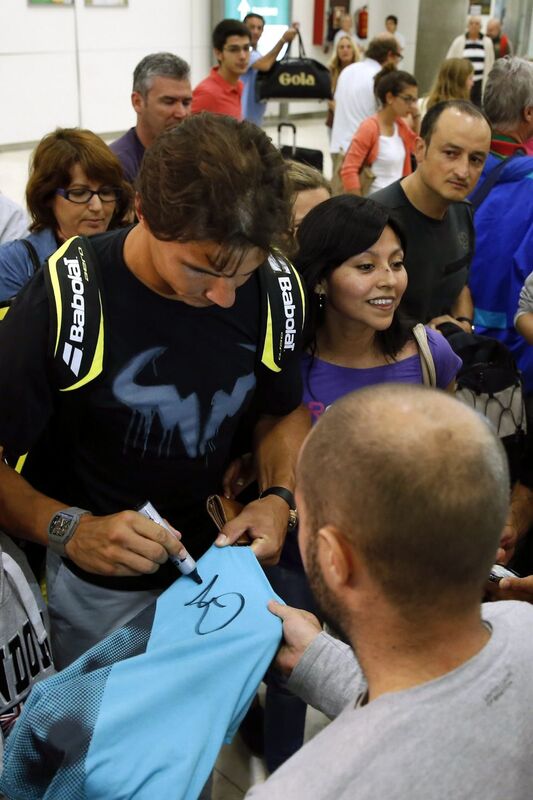 Rafa answered, visibly tired from the long flight, the swarm of reporters and fans who were waiting for him. " I feel tired after having played every game possible in the last month , "he acknowledged, although he was" happy "for the win in the Grand Slam and be back in Spain to help the team in Davis. A return trip he made on a commercial flight after refusing private jet Tennis Federation was willing to charter to bring to Madrid: "I think it is right now, as things are. I think it would not be as much difference to arrive yesterday (Tuesday) to Wednesday ". What is not said is whether it will be available to play individually in the first round against the Ukrainian team. "do not know if I'll play on Friday. Today will train a bit, tomorrow too ... " said Rafa, who is expected to make contact with the land of the Magic Box in training this afternoon at 15:00 hours. Alex Corretja, team captain, will not make a decision on their individual alignment on Friday to talk to your number one and evaluate their status: "When we know how it is, we will take a decision."